Prague is one of Europe’s most visited cities, both by foreign as well as Europeans. But Prague’s charming squares and picturesque cobblestone streets are clogged. Tourists toting cameras, taxies ferrying families from one side of town to another – every time I return, I am aghast at just how busy it is. That doesn’t mean I don’t enjoy it, in fact it still is one of my favourite places to visit. However, I highly recommend during your visit you take a day trip out of town and visit the Czech countryside. It’s quite different and will be good for you if you’re feeling like quarters are a bit cramped. Perhaps a bit of a morbid place to start, but Kutna Hora is a popular daytrip from Prague. 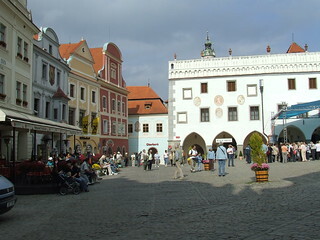 Firstly, it is an adorable town, with that bohemian architecture that brings the crowds into Prague. But Kutna Hora’s most popular spot isn’t the town square or the cafes, it is the church – or specifically, the “bone church.” Officially called the Sedlec Ossuary, this chapel located underneath the Church of All Saints has furnishings of all sorts made of bones. Bone chandeliers, bone crosses, and walls lined with bones. Not for the light hearted but it’s an insightful look into the past. Another top spot to visit in the Czech Republic is Karlovy Vary. It’s a spa town, so you’ll find many opportunities to buy special drinking mugs (there is a sipping spout in the handle) so you can sample as much of the local mineral water as you like. The smell is similar to the taste – think sulphur – but supposedly it is known to cure many ailments. The town is set in a valley and in the hills above there are lots of great walking trails, but you can also just hang out in town to eat and drink – one of the major Czech liquor brands, Becherovka, is from here. I think Český Krumlov might be the prettiest town in Europe. It’s just one of those places that it seems time has left alone, leaving cobblestone squares surrounded by pastel coloured buildings and little shops that are touristy, yes, but still wonderful to visit. The views of Český Krumlov from the tower or from across the river that runs through town are nothing short of postcard perfect, and you’ll find plenty of good Czech food (and beer!) here. It’s a longer trip, so stay overnight if you can, but a Czech must in my book. Karlštejn Castle is one of the most visited in the Czech Republic, and the reasons are obvious: it’s gorgeous. It’s a unique design, unlike no other castle in the world – in the large central tower lies a inner chapel. To reach the chapel required passing through four doors, each with nineteen locks (and the keys of course kept separately). Inside were secret state documents as well as the Bohemian Coronation jewels. It’s hard to believe that this castle was built in approx. 1348-1365 and yet still stands strong today. 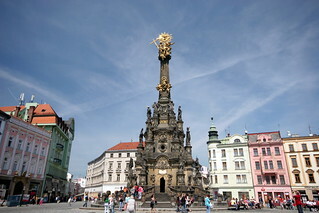 Olomouc is actually a university town with few tourists. That’s a shame because it’s known as the city of squares – as you walk around town, you’ll notice, they seem to be everywhere, each square with its own set of monuments, murals, or other décor. As you can imagine, Olomouc has a thriving café and bar scene though English isn’t as handy as it might be back in Prague. The most important sight is the Holy Trinity Column, a UNESCO World Heritage Site. Next to it is another one of the country’s floral flocks, similar to the one in Prague but far less crowded. Image Credits: tscherno, amanda63, chris-yunker, lwy, anapaulahrm.